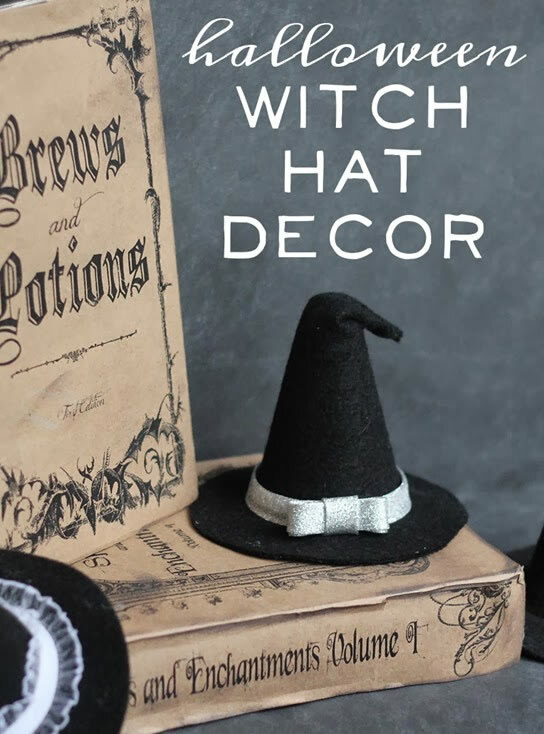 Early this Halloween season, I was making some felt witch hats but was finding that without actually stuffing them, they weren’t holding up very well and they looked kind of flimsy. Lucky for me, when I was walking through the Dollar Tree a few days later, I found some mini construction cones! Well, if those didn’t scream “WITCH HAT” to me! 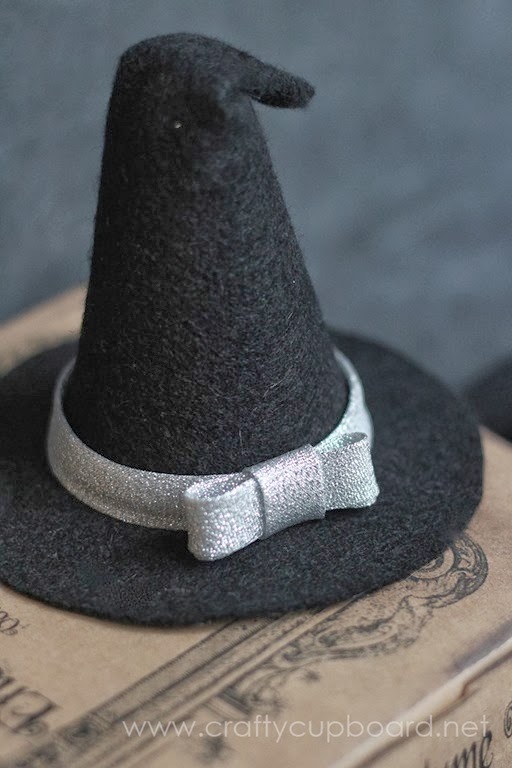 I grabbed a few and headed home to try round two of the witch hat project, and it turned out SO cute! They were really easy to make so I’ll show you how I did it! First, gather your materials. 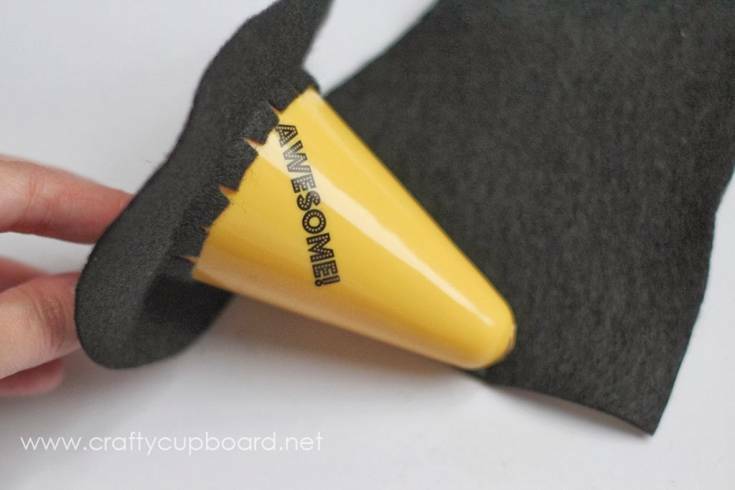 You need a cone (floral department cones would work too), black felt, any desired trim, and a hot glue gun. Use scissors to cut the square base off the cone, leaving about 1/4” for the hat brim. 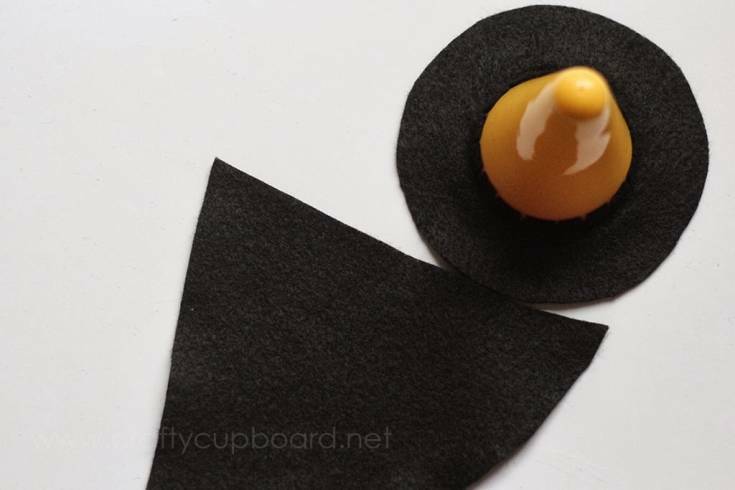 Using your cone as a reference, draw a circle onto your black felt that will make a wide hat brim. Then, cut out the center (don’t cut it wider than the base of your cone!) and notch the edges so it fits over the cone and also so you can glue it to the cone. 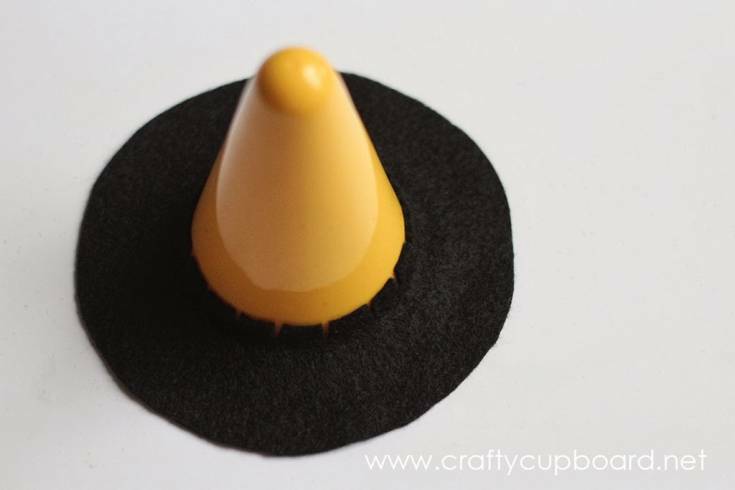 Next you will need a wide pie shape- I just wrapped a piece of felt around my cone and cut the pie shape from how it was fitting around the cone as a cheater method. I know I could use some elaborate math to figure out exactly what the pie size is, but I’ll take the math-less route any day. Start with one edge of the felt and glue it to the side of the cone, covering the notched section of the hat brim. Start wrapping and gluing until the other side meets, and glue it in place. 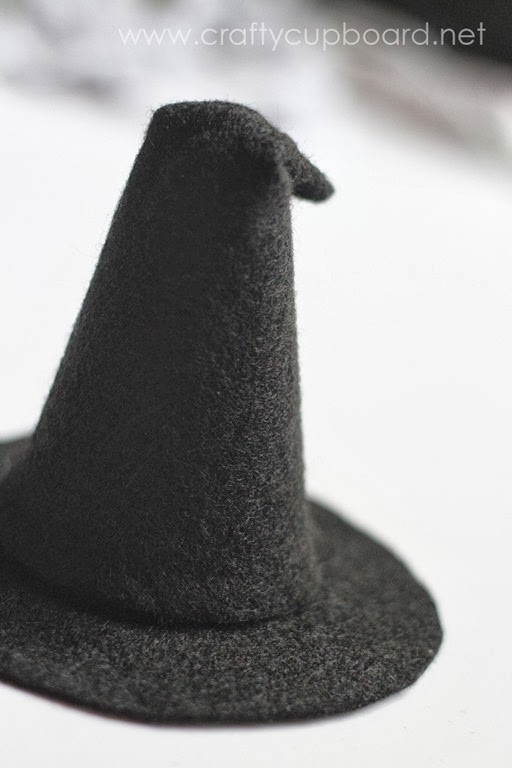 You’ll end up with a simple, cute, pointy witch hat! 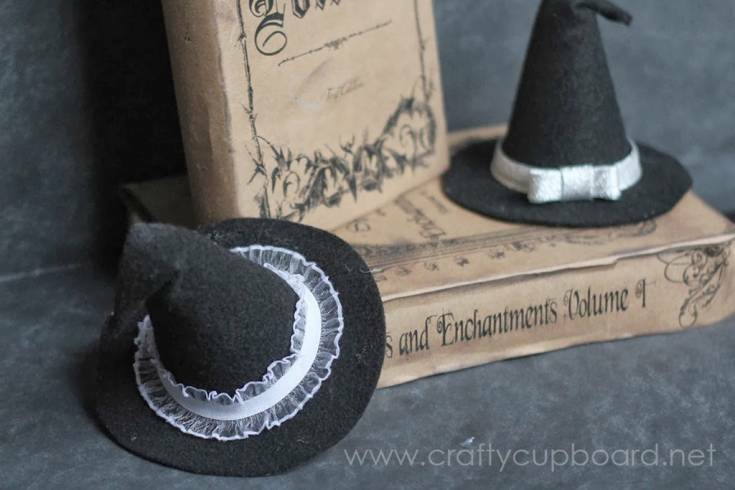 But I wanted to keep going and fold over the top of the hat for a floppy witch hat look. I simply put a dab of glue where the hat folded over on itself. Glue a favorite trim around the base of the hat, in my case it ended up being silver bias tape. I added a little bow too! And that’s it! 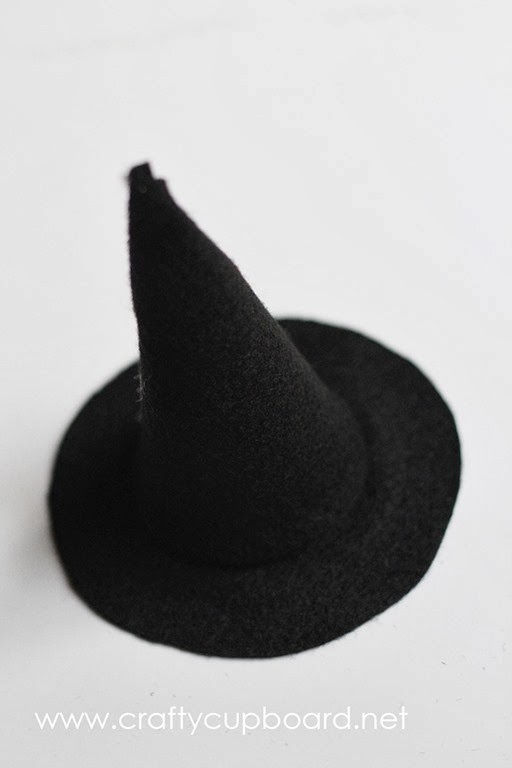 a 5-minute Halloween witch hat. They’ve been sitting around my house amongst my Halloween décor for this season and I think they are so cute! I even pull them down every once in a while and my girls play with them. The cone inside helps keep them in great shape and they still look as good as new. I had fun going through my trim box too for the little extra embellishments. I left one hat plain, but I might go back and add that lacy trim from the top of this post. It looked so cute!